Meeting Mr Brainwash (6:00) is a multimedia article featuring the artwork of contemporary artist Mr.Brainwash. Created by Indira Cesarine, the animated article presents an amusing take on the rising success of Mr. Brainwash, and how he influences those he meets with his energetic personality. XXXX Magazine, “The Untitled Magazine” creative director, Indira Cesarine, first encountered Mr.Brainwash at the Scope Art Fair in Miami in 2008, and he later became the inspiration for this piece on his work and modern tactics of promotion. Music “2 the Master” by Nathan Roberts, animated by Alena Ahyeon Yoo. Mr. Brainwash or MBW is the moniker of eccentric French filmmaker Thierry Guetta. After years filming the likes of Bansky and Obey he has put down the camera and taken up the spray-can and become one of California’s most prolific street artists. 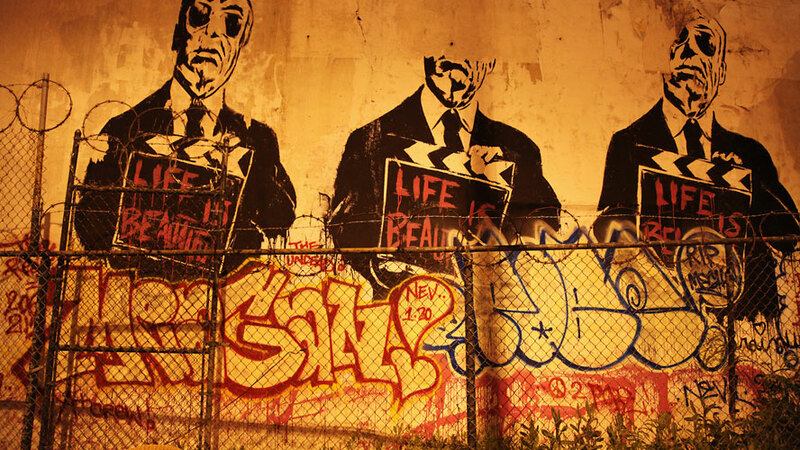 MBW started documenting the street art of Obey back in 1999, and it was through Obey that he was introduced to Bansky. MBW has collected hours of footage often risking his own neck following artists at work. He is still filming today at events such as the massively successful Cans festival under Waterloo train station. MBW’s first solo show “Life is Beautiful” in LA, June 2008 featured over 100 works in a 15,000ft sq TV studio and had fans queuing round the block to get in on its opening night. He referenced artists such as Duchamp, Jackson Pollock and Robert Indian in his works, but it is Warhol whose influence is strongest. MBW use icons of consumer culture and celebrity and mixes them with early pop art images to create his own pop art and graffiti hybrid. Borne in South Africa, Nathan Roberts has been producing hip-hop and dub for about 5 years. Starting out with dub quartet Crouching Squirrel, they fast became Cape Town local legends, with a residency at Cafe Dharma. With live performances with the Flying Monkeys at the Luxembourg Fete De La Musique and at the Glade Festival (UK) Nathan Roberts has begun to make his mark on the international scene. For this track DJ Nate joins forces with the Simplicity Project. Her photography has been published in numerous international publications including British Vogue, British GQ, British Marie Claire, Tatler, Flaunt Magazine, British Esquire, Elle, L’Officiel, French Glamour, Harper’s Bazaar, In Style, The Times Magazine, Grazia, Oyster, Out, Lush Magazine, Surface and Arena. She has worked commercially with clients including Cerutti 1881, Nino Cerutti, Charles Jourdan, Christian Dior, Kenzo, Seven Jeans, Agent Provocateur, Wonderbra, DIM, Passionata, Harvey Nichols, Neiman Marcus, Harrod’s and The Body Shop. She has photographed celebrities for such titles as In Style, Tatler, and Esquire including Alicia Keys, Collin Farrell, Dakota Fanning, Macy Gray, Amy Winehouse, Anna Paquin, Lauren Hutton and Jimmy Fallon among many others. She also has collaborated with record labels such as Sony BMG, Jive Records and Virgin Records. Indira and her work have been featured internationally on TV shows such as MTV, E! TV, Entertainment Tonight, Inside Edition, HBO’s Special “Ford Supermodel of the World”, “Make me a Supermodel” UK and US editions.